To this point, the Notre Dame Fighting Irish (11-0) have had nothing short of a magical season. Coming into the season, Notre Dame looked like it would have another traditionally challenging schedule with matchups against Michigan, Stanford, Southern California, Florida State and others. An opening week 24-17 victory over No. 14 Michigan still proves to be the best win in the country to this point this season. With the College Football Playoff looming, Notre Dame currently sits comfortable at No. 3 while Michigan is on the bubble at No. 4. The Irish remained at home in South Bend to pick up two scrappy wins against Ball State (24-16) and Vanderbilt (22-17). While the Irish offense struggled in these contests, the defense managed to step up and play at a high level when it counted. In week four against Wake Forest, head coach Brian Kelly decided to shake things up as quarterback Brandon Wimbush would be benched in favor of Ian Book. Book ignited the Irish offense and carried them to a 56-27 rout of the Demon Deacons. No. 8 Notre Dame returned home for its fourth home game in five weeks against No. 7 Stanford on Sept. 29. Book once again lead the Notre Dame offense at a huge performance and a 38-17 victory. No. 6/7 Notre Dame went into Lane Stadium to take on No. 24 Virginia Tech, who had just been stunned a week previously by Old Dominion. A primetime road matchup in an atmosphere such as Lane Stadium could have easily knocked the Irish off their undefeated path. Despite being tested in the first half, Notre Dame pulled away in the second half to finish the 45-23 victory. When No. 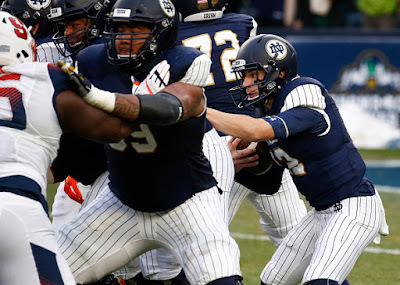 5 Notre Dame returned to South Bend to take on now-ACC Coastal champions Pittsburgh, the Irish were heavy favorites to steamroll the Panthers. Notre Dame struggled through the Pitt game but still managed to pull out a 19-14 victory to move to 7-0. After a bye week, the Irish headed west to San Diego to take on the Navy Midshipmen. Traditionally, the Midshipmen’s triple-option offense tends to be tricky for the Irish defense, but the Irish dominated for the entirety of the game en route to a 44-22 victory. Following the win over Navy, Notre Dame returned to the road and headed to Evanston, Ill., to take on the Northwestern Wildcats. Northwestern has been a pesky opponent to several teams throughout the season, including the Michigan Wolverines. Notre Dame took control of the game in the third quarter and didn’t look back, defeating Northwestern 31-21. Perennial powerhouse Florida State has had a disappointing season and looked to turn it around with a statement win over the undefeated Notre Dame Fighting Irish. The Irish held a 17-0 lead over the Seminoles after the first quarter and never looked back, improving to 10-0. Last weekend, the No. 3 Fighting Irish headed to New York City to take on the No. 12 Syracuse Orange in the Shamrock Series at Yankee Stadium. In what was shaped up to be the best game of the weekend, the Irish completely dominated the Orange for the entire game, blanking the offense until the final seconds of the game in a 36-3 win. In their final regular season game, No. 3 Notre Dame heads to arch-rival USC to look to complete a perfect regular 12-0 mark. The Trojans of have struggled mightily this season, sitting at 5-6 overall and a 4-5 record in the Pac-12. USC is coming off of back-to-back losses to California and UCLA. Knocking Notre Dame off would be the perfect scenario for USC fans as it would all but ruin Notre Dame’s chances of making the College Football Playoff, which would secure bowl eligibility for the Trojans. The Trojans and Irish will battle for the Jeweled Shillelagh under the lights of Los Angeles Memorial Coliseum on Nov. 24 at 8 p.m. ET (ABC/WatchESPN App). Notre Dame last defeated Southern California in Los Angeles in 2012, when the Irish also completed a perfect regular season and went to the BCS Championship game against Alabama. The Irish’s playoffs begin now and need to make an impact in order to keep its spot and become the first non-power five school to make it to the College Football Playoff.